ConFoo 2015: Only 30 tickets left. Will you be among us? ConFoo is next week and will bring you over 140 technical talks, presented by 90 local and international experts, over the course of three days. It's a unique opportunity to learn from the best and make new friends. 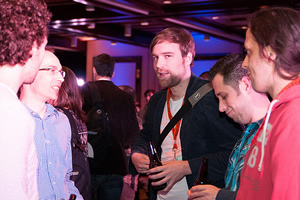 Hang out with the ConFoo crowd at Hurley's on Tuesday night starting at 5:30pm. Enjoy drinks, food and a pleasant atmosphere. Intuit will sponsor the drinks. Address: 1225 Crescent Street. The event is open to the public so you can invite your friends and colleagues. The cocktail starts at 4:00pm. ConFoo is only 14 days away and tickets are selling fast. Get yours before we're sold out, like in the last three years. In addition to the conference, we also have 2 days of training. Places are very limited for these so don't wait. The training is sold separately.